Educated in Paris, obsessed with the Cassandra myths and passionate about theatre, Nalini Malani is an artist of great wit, will and wisdom…. 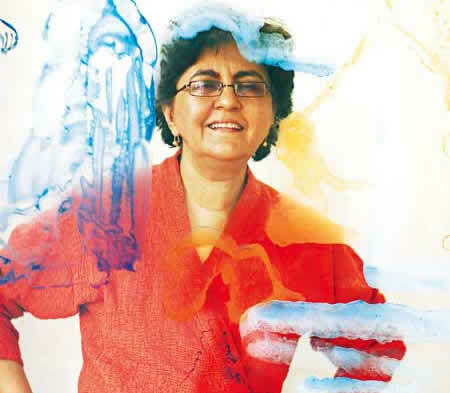 Nalini Malani is an artist of great wit, will and wisdom. A worthy recipient of the Fukuoka Arts and Culture Prize in 2013, her work is influenced by her experience as a refugee during the partition of India and is fuelled by her struggles as a female artist in a male dominated society. Her practice encompasses drawing, performance, installation, and video and includes collaboration with other artists. Starting out: She got interested in drawing because of her biology teacher. Back then, doing art was not like a university course; it was like having a diploma in plumbing or like being an electrician. Her father thought she was crazy. There was no such thing as a woman artist. She was fortunate to get a scholarship to study in Paris. First studio: It was a space in a huge bungalow in Mumbai given by a private foundation and was shared with artists, theatre artists, musicians and dancers. Next inspiration: The courtesan culture of South Asia.